File photo Some of the participants of a recent Lucasville Trade Days. Lucasville Trade Days has been named one of the best flea markets in the state of Ohio by the website Only In Your State. On the website ranking, Treasure Aisles Flea Market in Monroe, Ohio, fared No. 1, followed at No. 2 by Lucasville Trade Days held at the Scioto County Fairgrounds. Trade Days was first established in 2014 after the Southern Ohio Poultry Association moved Swap Days to Ross County. Jim Wirth, spokesman for Lucasville Trade Days said it was not his intent to go after Swap Days. He wanted to fill a gap that created by the events departure from the fairgrounds. Wirth estimates that as many as 20,000 people have visited the market in one weekend. Organizers with Lucasville Trade Days recently signed a multi-year lease agreement with the Scioto County Fair Board. The agreement establishes Lucasville Trade Days three times a year at the Scioto County Fairgrounds in Lucasville. “We love the Scioto County Fairgrounds, and down-home folks who live in the surrounding area. It’s a beautiful facility, with nice clean buildings, plenty of shade trees, paved areas and lots of parking,” Wirth said. Kim Bauer, director of the Portsmouth-Scioto County Visitors Bureau, said the ranking is a testament to Wirth and work that’s been done to promote the event along with bringing more people to the community. The next Lucasville Trade Days is scheduled for Sept. 26-27 at the Scioto County Fairgrounds. 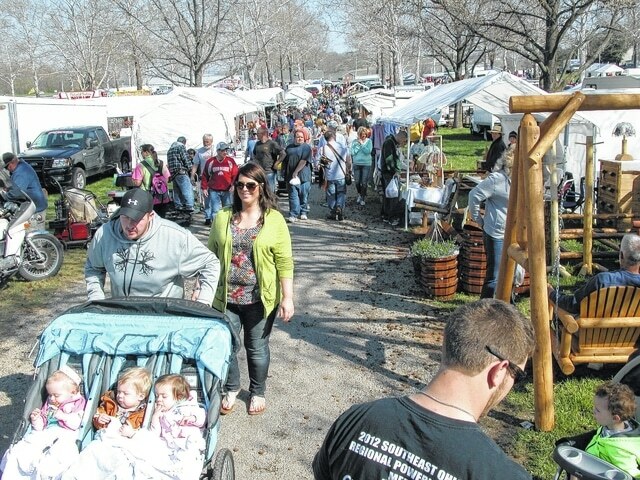 For more information about Lucasville Trade Days visit, www.lucasvilletradedays.com. Other flea markets on the list include Trader’s World Market in Lebanon, Springfield Antique Show and Flea Market that takes place at the Clark County Fairgrounds, Hartville Marketplace and Flea Market, Jamie’s Flea Market in Amherst, Hocking Hills Market in Rockbridge, Ohio, Four Seasons Flea and Farm Market in Youngstown, South Drive-in Theatre and Flea Market in Columbus and The City Flea in Cincinnati.